The Georgia Swarm defeated the Vancouver Stealth 11-10 on Saturday at home in front of 5248 fans at Infinite Energy Arena. The first period ended with 2-2 tie. It appeared, at least on paper, both teams were evenly matched. 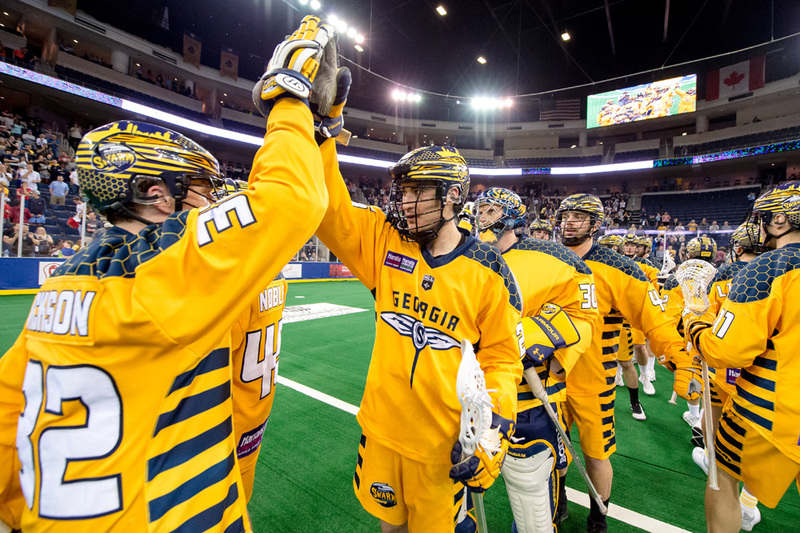 The Stealth pulled away in the second quarter, scoring five goals to one Swarm goal. The third quarter switched it up with Georgia scoring six while Vancouver scored two. What promised to be a high scoring fourth quarter proved to be anti-climatic. Georgia scored twice to Vancouver’s one. The top scorer for Georgia was Shayne Jackson with three goals and four assists on seven points. Rhys Duch and Corey Small each had two goals for Vancouver in the loss. Perhaps what won this game for Georgia was the number of shots they had and the number of ground balls they picked up. They outshot Vancouver by 12 and also scooped up 16 more ground balls. The power play, at 1-6, was concerning for Georgia. This is something that will need to be addressed as they look to move on to playoffs. They put together a good effort in the game, but the Stealth finish the season with a record of 2-11.